Terry Speers wins the Commonwealth Bank for 2002. Terry Speers of Como beats Carl Robertson of Bassendean 26/12 to claim his first Commonwealth Bank title. Checks the TOURNAMENT NEWS AND RESULTS for further details. "The winners of the 2002 Australian National Championships. After the disappointing placing in the Interstate cup after its good showing in 2001, Western Australia picks up where it left off, taking home more of the individual honours. Check the CROQUET NEWS for more details. "Good moments are caught in a snapshot." Snapshots of the Men's and Women's Maskew of the 2000/1 season. Click onto FLASHBACK for the photos of the tournaments. "There's more to croquet than just croquet"
Croquet has it's sisters, they're called variant croquet games. "Shooting Gallery" is one of the newer ones of the batch. Check out what could be the latest craze to hit our courts. Some useful coaching tips for the croquet players.Here the focus is on triple peel leaves for the bisque users. Check it out in "COACHING." "The journal of a croquet player"
Seeing into the mind of a croquet player through their words and thoughts. For more, check "CROQUET JOURNAL." "The voice of the croquet player"
Got something croquet related that you want to share with the WA croquet playing public. Be it a suggestion, an idea, a complaint, a question. Drop a line in the "guest book." The State Team for the Nationals 2002. 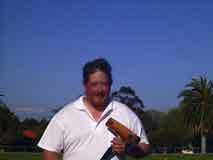 Check the STATE TEAM PROFILE for the team and individual statistics for the 2002 Australian Croquet Championships, Queensland. World Croquet Championships 97, Bunbury. The World Croquet Championships were held in the southern Hemisphere for the first time in 97. Check out WORLD CHAMPIONSHIPS for the action shots of the prestige tournament held at the Moorabinda Courts in Bunbury, 200km south of Perth. Editor's (Carl Robertson) Personal Web Site. LATEST: Interview and photos of Marjorie Parry Star Winner. WHAT'S NEW IN CROQUET WA? WA selections for National Development Squad. Changes for Nationals in Perth 2001. IN TOURNAMENT NEWS AND RESULTS. The season as it was for croquet. The Triple peel leave for bisque games. "I told you my first triple peel would be a delayed."